In comparative psychology, both similarities and differences among species are studied to better understand the evolution of their behavior. To do so, we first test species in tasks using similar procedures, but if differences are found, it is important to determine their underlying cause(s) (e.g., are they due to ecology, cognitive ability, an artifact of the study, and/or some other factor?). In our previous work, primates performed unexpectedly poorly on an apparently simple two-choice discrimination task based on the natural behavior of cleaner fish, while the fish did quite well. In this task, if the subjects first chose one of the options (ephemeral) they received both food items, but if they chose the other (permanent) option first, the ephemeral option disappeared. Here, we test several proposed explanations for primates’ relatively poorer performance. In Study 1, we used a computerized paradigm that differed from the previous test by removing interaction with human experimenters, which may be distracting, and providing a more standardized testing environment. In Study 2, we adapted the computerized paradigm from Study 1 to be more relevant to primate ecology. Monkeys’ overall performance in these adapted tasks matched the performance of the fish in the original study, showing that with the appropriate modifications they can solve the task. 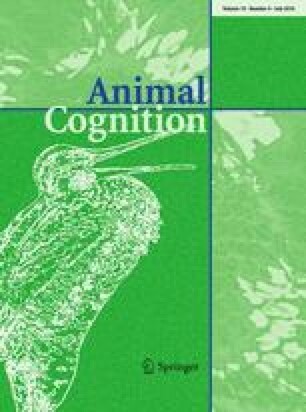 We discuss these results in light of comparative research, which requires balancing procedural similarity with considerations of how the details of the task or the context may influence how different species perceive and solve tasks differently. We thank Michael J. Beran for helping with computer programming. L.P. was funded by the Swiss Science Foundation (Doc.Mobility) and the Second Century Initiative in Primate Social Cognition, Evolution & Behavior (2CI-PSCEB) at Georgia State University. R.B. was funded by the Swiss Science Foundation. S.F.B. was funded by National Science Foundation Grants SES 1123897 and SES 1425216. All applicable international, national, and/or institutional guidelines for the care and use of animals in this study were followed. All procedures performed in this study were in accordance with the Georgia State University Institutional and Animal Care and Use Committee (capuchins: A13022, rhesus: A13021) and met the standards of the USA.